Lisa, the force behind Rice Camp Blog, loves interior design. Her family is working on remodeling its 1970s home, but she wanted more, so she branched out to renovating campers too. Not just any campers, mind you – Lisa loves working with pop-up tent campers specifically. She loves crafting and making things look beautiful, and this hobby helps her do both. 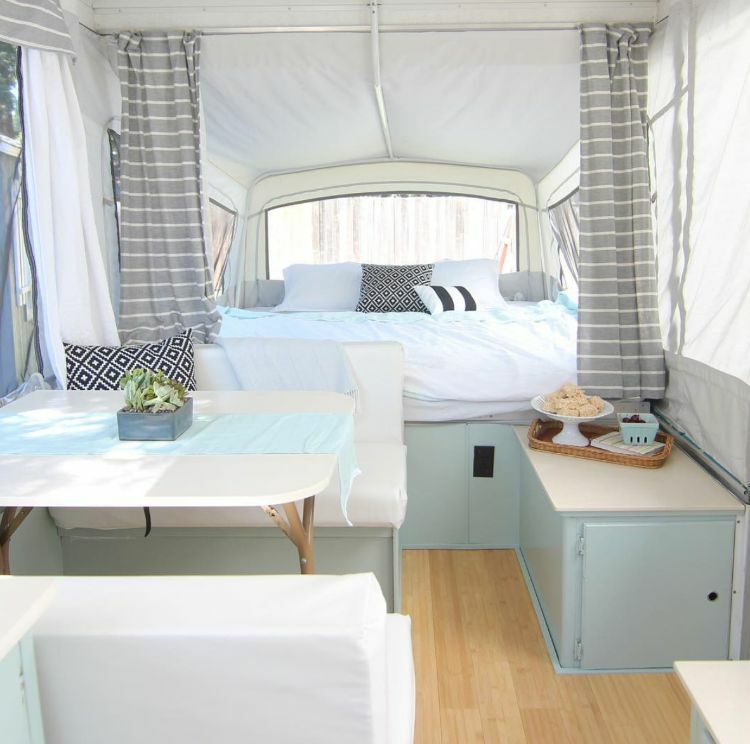 With help from her husband and two children, Lisa has renovated three campers so far. She quickly redid the first two – trailers she named Alvin and George – and easily sold them to eager buyers. 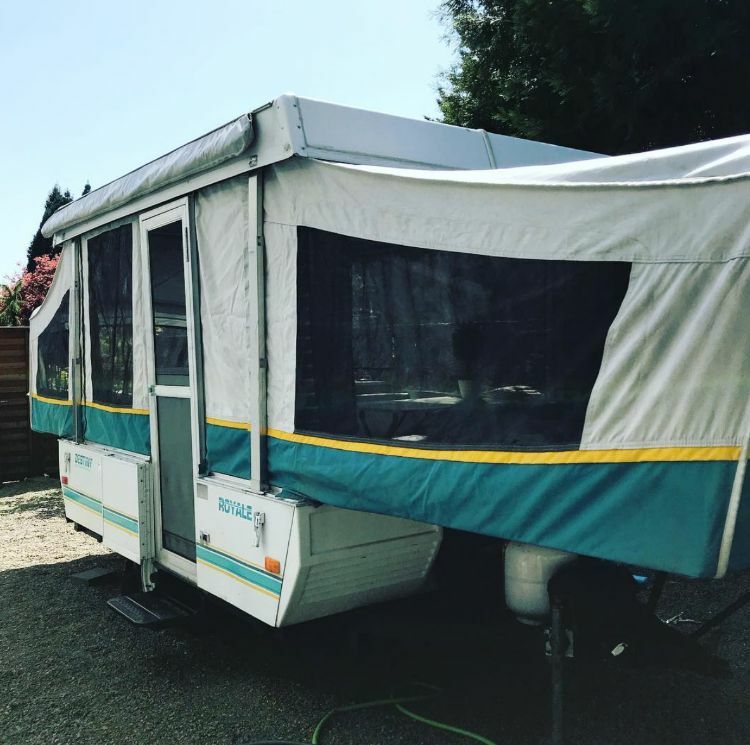 Her most recent purchase was a pop-up trailer in excellent condition; she named it Mike after the man who sold it to her. The camper didn't really require any renovations, but what would be the fun in that? Under Lisa's care, it went from standard and dated to stylish and modern in a jiffy. Lisa wrote that Mike clearly had a lot of love for this pop-up. He took excellent care of it, she said, and she just knew that would be the case because Mike took of his shoes to enter when showing it to her. Anyone who respects a camping trailer that much must really care about it a lot. Inside, Mike the Trailer was in good shape too, but it was decorated with all of the original decor that came standard when it was originally built. Mike's canvas and screens were clean and intact, though, and that is one of the most important things to investigate when shopping for a used pop-up. The kitchen had a working sink and stove, but it still had old wooden laminated cabinets underneath, which made the trailer look old-fashioned. 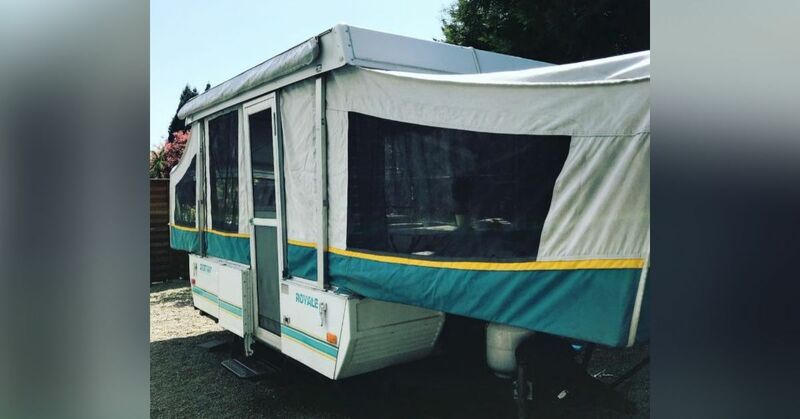 The beds were in decent shape and were still comfortable, but the standard factory curtains made this camper look older than it actually was. The upholstery pattern of the dinette seating was no help either. 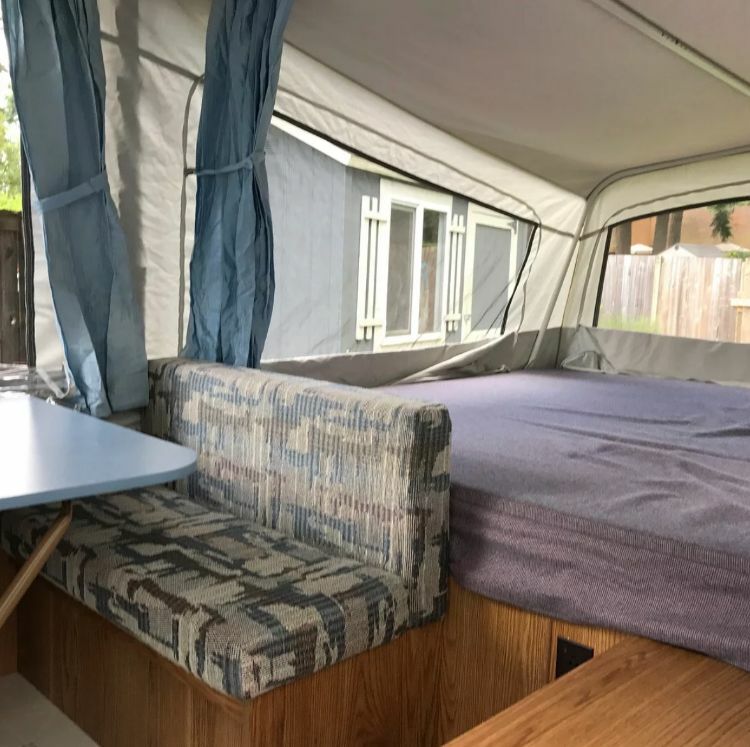 This camper was probably first built and sold in the late 1980s or early 1990s – and it showed. The table was sturdy and functional, but its blue color wasn't very appealing. The white linoleum flooring was not very pleasant either. Lisa knew she could do better than this. After some hard work, the transformation was breathtaking. 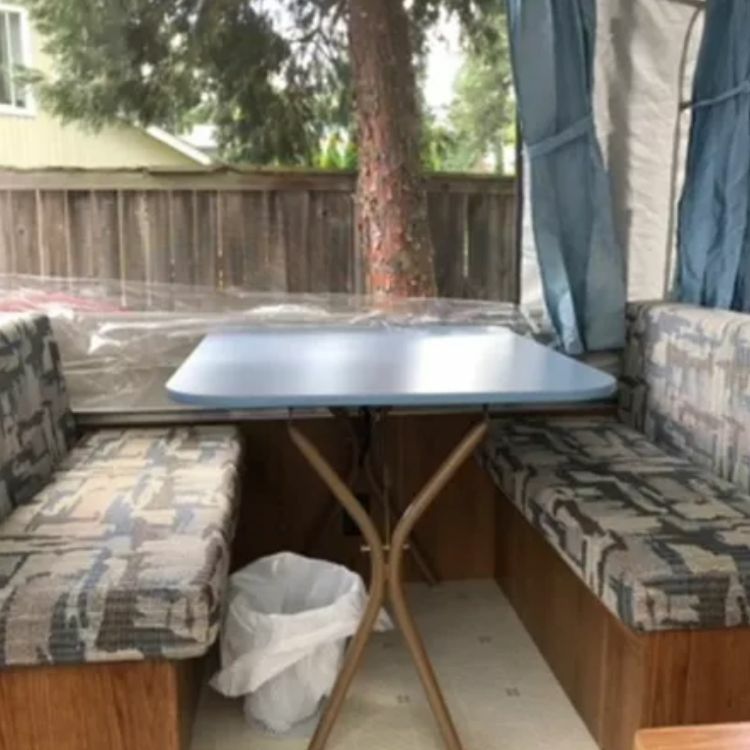 It looked like an entirely new camper and like something out of a magazine. Lisa replaced the floors with some real bamboo flooring that she found on Craigslist for only $10. She painted the table and countertop with Rust-Oleum Countertop Coating, and the new color made everything look so much more modern. She took a sewing class to learn how to make new slipcovers and created them out of white vinyl. 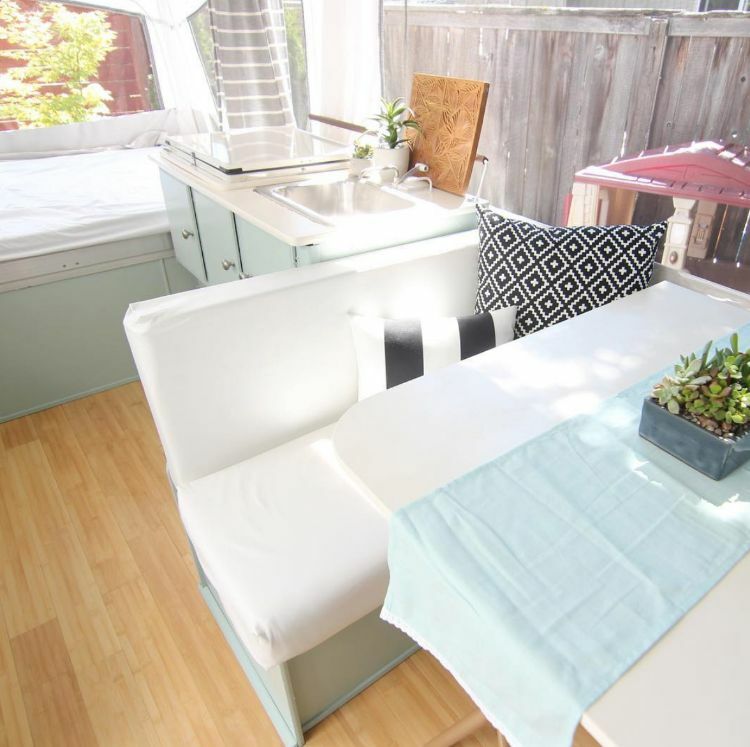 The table runner, plant and pillows provide additional touches that make the dinette look even more inviting. Lisa primed the cabinets with primer she already had and painted them with Benjamin Moore paint in Wythe Blue. Of all the wonderful changes she made to Mike the Trailer, this simple change made the biggest difference. The newly painted cabinets they look so much better than they did before. 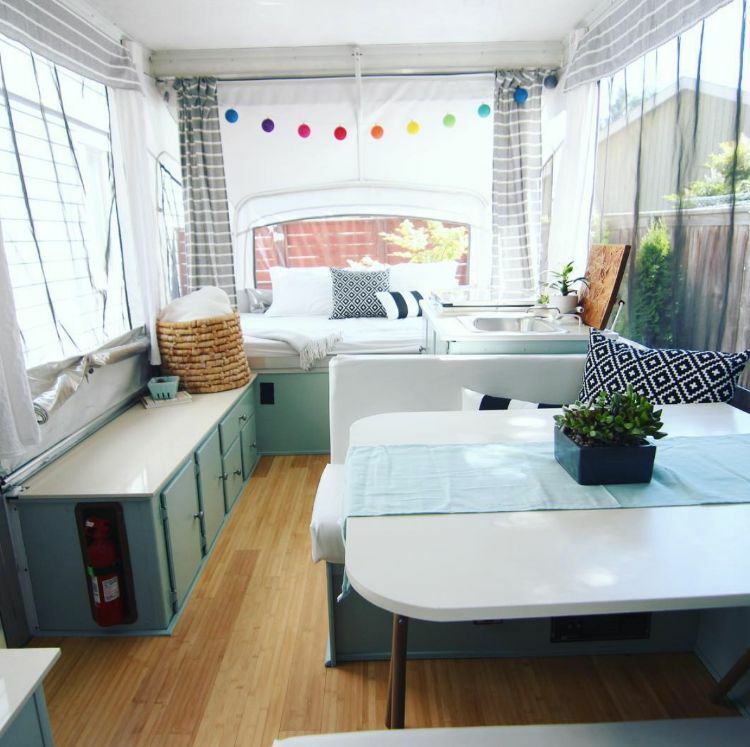 They gave the entire camper a very clean, fresh and contemporary look. To create new bunk curtains on both ends, Lisa hemmed cloth shower curtains. She also used her sewing skills to create white curtains for the side windows to replace the blue ones. The pillows on the bed match the pillows on the other bed at the opposite end and the pillows on the dinette seating, which really helps to tie the space together. Mike the Trailer is back to beautiful thanks to Lisa's hard work and creativity. 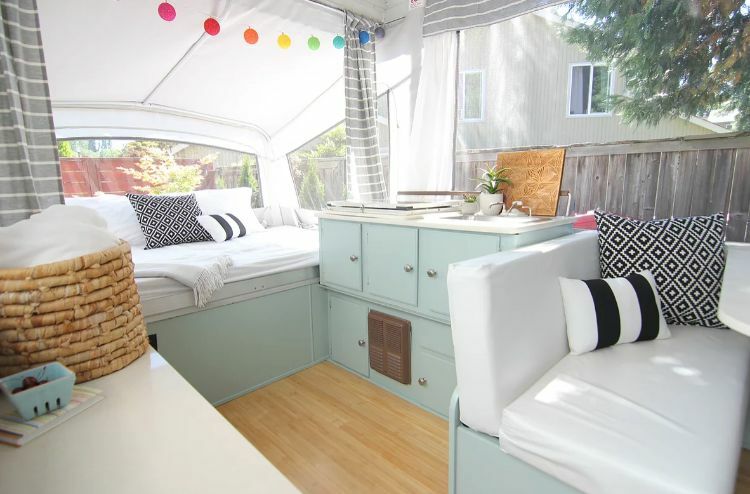 This pop-up is now a comfortable space any camper would love. 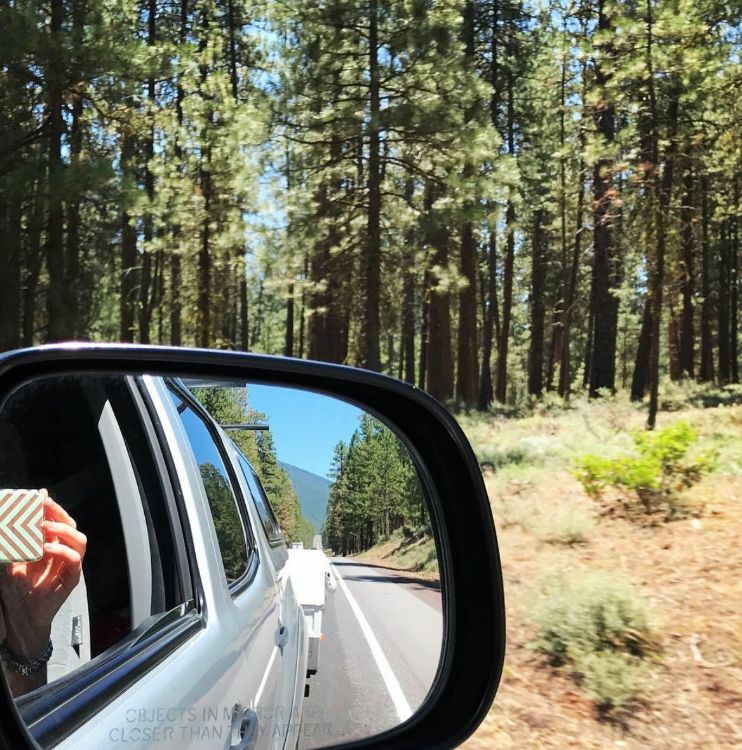 Lisa and her family took Mike on a camping trip of their own before they sold it and had a wonderful time together in the woods. Lisa is certainly itching to get another one to renovate and to start the process again. Fair winds, Mike – and congratulations to Lisa, too. This renovation is nothing short of incredible, and the pop-up's new owner will surely be very pleased.